begin by being born and toil in labor to the end. our grades and growth of wealth in small installments. for flags to drape our coffins when it’s over. Do we need to tell you what’s the matter? Amaya hosts at dVerse and wants us to embed a quote about global peace, human right and social justice in memory of Martin Luther quote. We are given some quotes but you can chose your own. Mark the quote in bold. The words have to appear in the same order in the poem as in the original poem. Tags: Martin Luther King, peace, poetry, What's important? A wonderful way to embed the quote. I love the play of opposites presented here. I imagine people turning to stone.. This is one of my favourite paintings, and you’ve coupled it with a marvellous poem. We need the constant reminders as we seem to forget the pains of the war & sacrifices of others. Its far safer to be silent…..tell us what’s the matter! I’ll try, but I don’t think I can do it. I love “begin by being born.” So passive, as we often are. I like your image of the people becoming passive like the stones and the hills watching the river flow past. Nice piece! A passionate plea for peace! You embed the quote so well! We really do get caught up in what we know as “life” but I think we are very mistaken. You chose a powerful quote and delivered an equally powerful poem. Great poem and a great quote. I love that “we become the soil”. How true. You remind us how imperative it is to not just believe, but to declare that belief; not to just live, but to proclaim our life. The idea of becoming soil is haunting to me because it makes me wonder if we don’t become bold in conviction then our whole purpose is just to become a viable place for other, better, and bolder seed to grow. 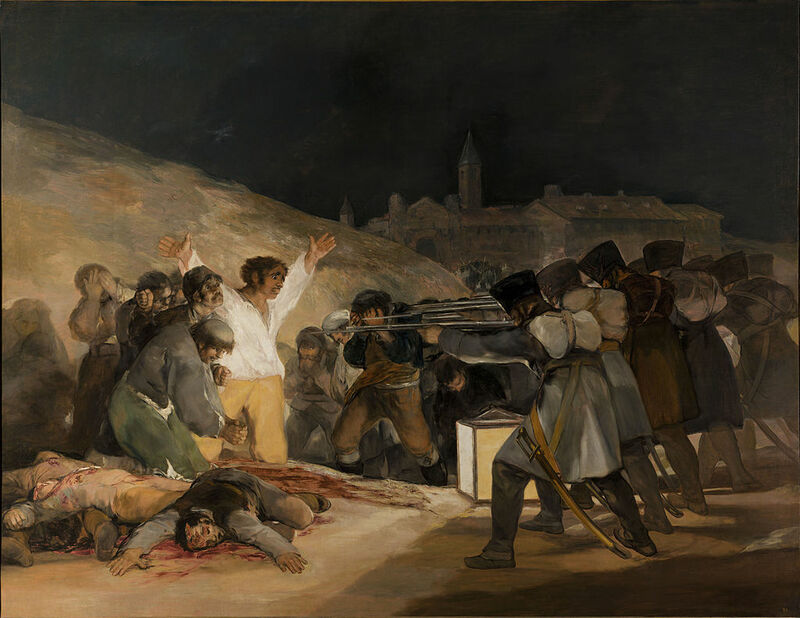 And love the Goya image to accompany the poem. One gets to aspire for the good times naturally! But how one gets along the path in between makes life interesting! Well done! You described our rat race life very well! Great incorporation of the quote! Sadly we are so much like puppets on a string that must consume regardless of the harm it may do us and others elsewhere and when trouble breaks out we must be the fodder for war and are encouraged in the name of patriotism rather than the greed of multi-national companies that must make a profit. A nice play with the words, plus your poem carries their meaning even further in an excellent way. Just my humble opinion, of course. This is so evocative, Bjorn. We become so caught up with our lives and insignificant problems that we forget about what’s real and wrong with the world.. sigh..
Well done and bravo Bjorn! I especially love the concept of recycling a fresh battle for freedom. wow man *snaps fingers* i felt this. also, “our grades and growth of wealth in small installments.” — that rhythm, damn! I like the subtlety of this both in the message and it’s connection to the quote. Such a creative way to embed the quote and to take it and create your own original statement through poetry. The end for many comes way too soon. I love the way this turned out. Nicely done.